In small bowl blend butter, molasses and lemon juice with fork. Rub chops on both sides evenly with pepper. Grill chops over a medium-hot fire for 12-15 minutes, turning once. Top each chop with a tablespoon of molasses butter. 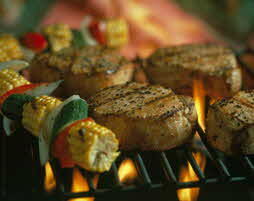 There’s almost nothing to compare to the aroma of pork on the grill; and these chops live up to that taste memory. The molasses butter adds an unexpected and pleasant flavor punch to chops hot-off-the-grill.